By Laura Maye on Wednesday, January 29th, 2014 in heritage, news. Between the 15th and 17th of January, a co-design workshop organised by Waag Society, Sheffield Hallam University and the University of Limerick was held in Limerick, Ireland. Through co-design, the future users of the meSch toolkit – cultural heritage professionals – are encouraged to collaborate with designers, technologists, and researchers and become actively engaged in the design process. Fifteen partners from the various institutions involved in the meSch project participated in the workshop; they represented the heritage, design, technical and research aspects of the project. During the three-day period, the participants were challenged to devise scenarios of use and generate requirements for the meSch platform taking into account different types of potential users. The first day of the workshop was held at the Absolute Hotel in Limerick. After a brief catch up presentation from all the partners present, the University of Limerick team presented findings from the interviews they conducted from July to December 2013. These findings then fed into the afternoon session, which was chaired by Waag. 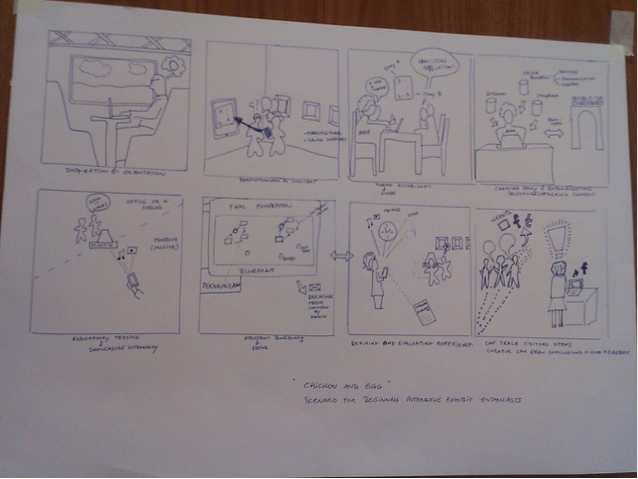 Participants were divided into groups to develop scenarios for use of the meSch authoring tool through storyboards. Local cultural heritage professionals also attended this session for a period of time and provided their insights. At the end of the afternoon session, each group presented their ideas to the rest of the participants. 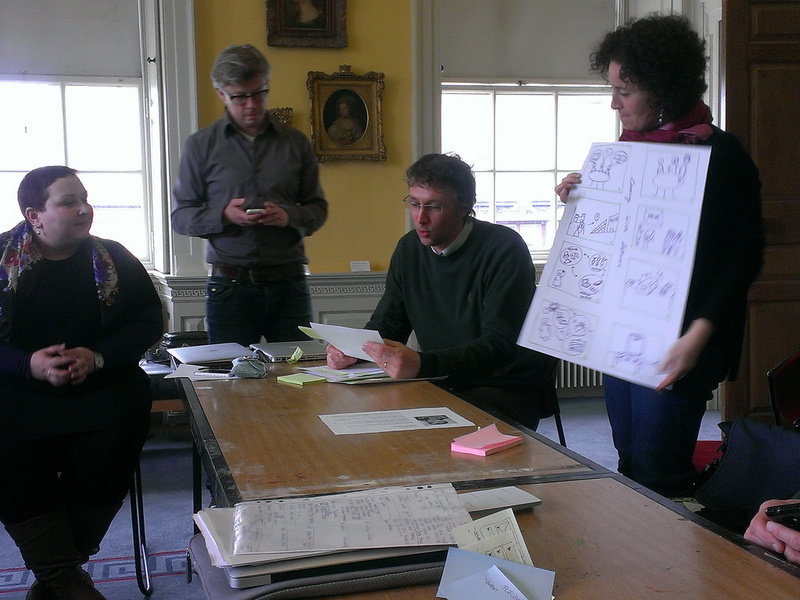 On the following day, participants gathered at the Hunt Museum in Limerick to continue with the workshop activities. The Hunt Museum was an ideal location as the group were inspired by museum objects surrounding them; these objects are part of the collection that John and Gertrude Hunt acquired. The groups from the day before reconvened to devise detailed requirements for the meSch platform during the morning session. In the afternoon, Sheffield Hallam University chaired a design activity aimed at developing narratives for selected museum objects. A member of the museum staff joined in for both sessions; she provided her opinions to the group. During the afternoon, a docent working at the Hunt Museum provided a tour of the museum to the meSch participants, unearthing the mysteries and stories behind the collection accumulated by the Hunt family. On the third day, the participants met again in the Absolute Hotel to finalise the requirements for the user groups and the meSch platform. Reflecting on the design workshop, participants noted a sense of convergence with relation to design ideas generated and a sense that participants were clearly learning from each other. This reflecting point is important because learning from each other is crucial in the co-design process. The requirements and scenarios produced during the three-day workshop will be referenced and refined continuously throughout the course of the project and will feed into the development of two meSch deliverables (reports): one deliverable relating to the user-system requirements for the meSch platform led by Sheffield Hallam University and another deliverable describing exploratory prototypes and user scenarios led by Waag. Read about previous co-design workshops in Amsterdam/ The Hague and Trento. Check out more pictures from the co-design workshops on Flickr.